It's the Fourth Annual Bulgarian Wine Month thanks to BulgarianWine.com! You can read all of the reviews from the first year (2015), the second year (2016), the third year (2017), and this year (2018) by following those links. VINI was created by Vance Petrunoff, president of Bulgarian Master Vintners, as an affordable introduction of Bulgarian wine to the American mainstream market. 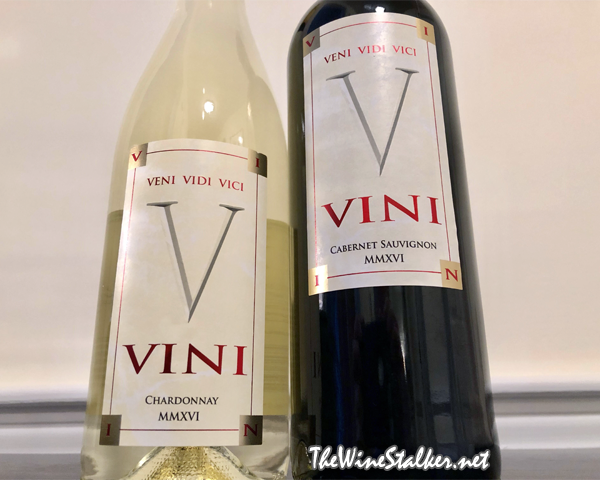 Today I've got the 3rd installment out of 3½ for VINI and it's for their new vintages of Chardonnay and Cabernet Sauvignon, both are out of Thracian Valley. This wine has 13% ABV and is a very pale yellow in color. It was fermented in oak barrels (15% of them new), put through malolactic fermentation, and rested sur lie on its lees for five months. The other half is done in stainless steel and also rests sur lie but for four months. At first the nose explodes with butterscotch but as it warms up and breathes orange blossom and pears take over, pushing butterscotch to the rear with baking spices. On the palate it's medium bodied with a smooth mouthfeel and the perfect amount of bright acidity to compliment the fruit but not make it tart. There's flavors of pears, pineapple, lemon custard, and ginger. Then it takes those flavors and brings them along on a surprisingly long finish. This wine has a 13% ABV and a dark inky ruby red in color. Also, just like the last time I had it, it's the star of the VINI portfolio. Well, maybe just for the reds now because that 2016 Pinot Grigio is pretty damn good too. It begins with a cloud of minerality above aromas of pencil shavings, cassis, and black cherries. Lingering in the background there's aromas of vanilla, black pepper, and mint. On the palate it's medium to full bodied with rich mouthfeel and finely grained, astringent tannin. There's flavors of cassis, blueberries, cocoa powder, and cedar. The tannin on the finish leaves your mouth completely dry and really delivers the words of BulgarianWine.com: A crisp, tasty, crunchy cabernet.